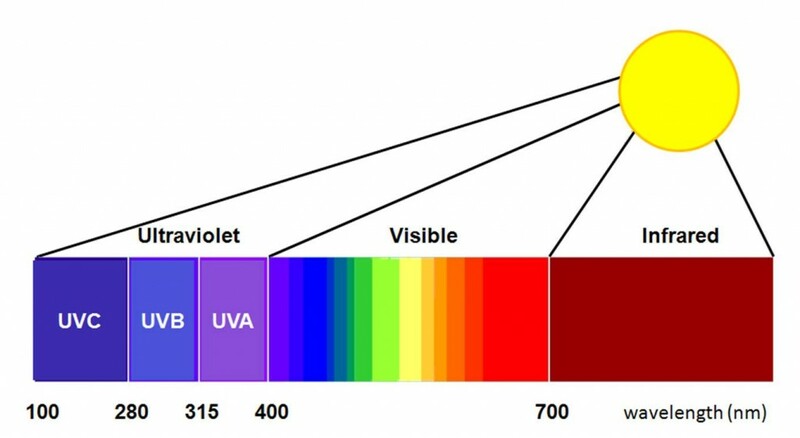 What is UV (Ultra-Violet) light? For over a century, scientists have known that certain frequencies of light have a devastating effect on microbial life. We know that exposure to UV-C ultraviolet light in the range of 254 NM (nanometers) disrupts the DNA of micro-organisms thus killing them and preventing their reproduction. 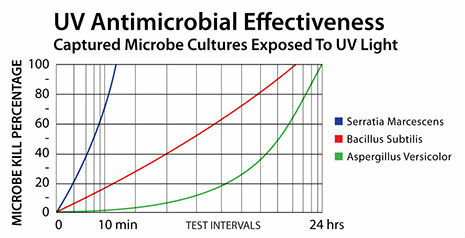 UVA are black lights for harmless fun, UVB causes sunburn and UV-C is the MOST effective at killing microbes. The shorter wavelength of UVC is able to penetrate micro-organisms cell walls and actually scramble their DNA. How does sunlight effect the earth? UV light from the sun is nature's way of controlling airborne micro-organisms. The Earth's ozone layer allows just enough UV light from the sun through the atmosphere to keep the air from being overly contaminated with bacteria and viruses. When did this technology start being used? Since the 1930's, UV technology has been used widely in the medical and pharmaceutical fields as well as the food and beverage industries to sterilize instruments, equipment and especially water treatment in homes and industry. 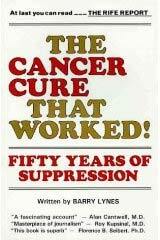 It's use for air treatment is more recent but is now commonly found in many hospitals, homes, pet centers and office buildings. Why is it important to use Ultra Violet light to clean the indoor air we breathe? Most of us spend 90% of our day indoors. The EPA warns that air inside our homes and offices is 5x more polluted than outside air and is one of the top environment health risks today. Indoor air is constantly being re-circulated through your heating and cooling system. Over time, the air becomes stagnant and serves as a breeding ground for yeast, mold, and bacteria which love the cool, dark and damp interior of your system. This is the ideal place for germs to multiply and spread throughout your house. What problems can "dirty" air in my home or business cause? These airborne microorganisms can cause a host of health problems, including allergies, asthma, sinusitus, dry eyes, ear infections, Swine flu (H1N1), Avian flu, headaches, strep, E-Coli, upper respiratory infections, neurological problems, sleep disorders, irritability and depression. In addition, clinical studies show that reducing indoor air pollution lowers the risk of stroke, cancer, diabetes, obesity, sleep disorders, asthma and other respiratory problems. What exactly are the things that make up dirty air? About 80% of the particle matter in your air is dead skin cells. The remaining 20% is made up of over 350 different contaminants, such as smoke, toxins, pollen, viruses, mold spores, mildew, fungi, dust mites, pet dander and chemical gases and odors from carpet, furniture and cleaning products. Environmental Science and Technology published a study that shows 10 harmful common chemiclas are found in 90% of household dust. Synthetic fibers in furniture, upholstry, foam, rugs, bedding, draperies, building materials, adhesives, air fresheners, dry cleaning, etc emit VOCs (Volatile Organic Compounds)! How does UV light stop these micro-organisms? The UV light intercepts airborne pathogens and destroys them as they pass by. As air cycles through the system, it passes by the UV light many times, exposing and re-exposing airborne microbes to its sterilizing effect. Our UV products actually kill germs by destroying their DNA and preventing them from reproducing. It's like bringing the natural poweer of sunlight inside for cleaner and fresher air. Do I need both a ROOM and a WHOLE HOUSE air purification unit? A room unit has a heavier concentration of UV protection and eliminates odors more effectively than a whole house unit because it draws contaminated air from the bottom. near the floor where the most micro-organisms are, and is processed through the killing chamber with clean air coming out the top. Some people have both units in their home. Where do air purifiers get used? Homes, basements, schools, offices, day care centers, medical facilities, nursing homes, funeral homes, hair salons, nail salons, cigar and vape shops, veterinary offices, pet stores, kennels, gyms, play centers, greenhouses all can benefit from using either room or whole-system air purifiers. Is UV light safe for children and pets? When a UV light system is installed in a central air system the germ killing effect takes place inside the air system and is limited to that area. There is no danger to any living thing in the home except microbes that are carried by the air into the central air system. Is it OK to look at the UV light? Never look at the UV light when it is lit. UV-C light can give your eyes a painful "sunburn". Unplug or disconnect the unit to work on it. Our air system isn't running so why is the UV light still on? These products are intended to be on 24 hours a day. Mold growth doesn't stop when the blower is off, and cycling the UV light on and off would shorten life of the UV lamp. How can we purify the air when the AC or heater isn't on? My UV light still glows after 2 years - do I need to replace it? Yes, over time the UV effectiveness of the lamps decreases even though the lamp may still be putting out visible light. The lamp's time designation refers to effective UV output not when the lamp will burn out. Will a UV light system kill mold in the walls? No. UV-C germicidal irradiation can only kill microbes on surfaces that the light shines on directly (surface kill) or that pass by in the air stream (airborne kill). Is there any difference between the low voltage and high (120/220v) voltage systems as far as efficiency of UV protection? No. The high and low-voltage power supplies are used to power the same lamps. The UV light intensity of our lamps is ideal to kill germs but not damage the air system interior parts with excessive heat. Is UV light radioactive? Will radiation spread into my home? No. All light is a type of radiation but not the dangerous kind. UV light kills germs by giving them an intense "sunburn" and it only affects things it shines on directly. Nothing spreads into the home except clean air. Can you touch the lamps? Never look directly at, touch, or expose skin close to the UV-C light. Does UV light kill kennel cough germs? UV-C light will sterilize nearly all microbes with very few exceptions. However, it only affects surfaces that it shines on directly or air that passes through it. Kennel cough is an airborne disease so UV-C would fight its spread through the air system but would have no effect on its spread by dog to dog contact. How long does it take for the UV light to kill mold? Is it OK for the air purifier unit to be installed in the return duct or should it always be on the supply side? The ideal mounting situation is on the supply side duct with the UV light shining towards the cooling coils but it can be effective mounted anywhere on the supply or return ducts. Where can I purchase a quality UV air purification system? URcleanAir, a division of URparamount, Inc, only carries top quality products. Click here to see our UV air purification products and our UV replacement bulbs. The RXair-400 is a portable room air purifier that uses high-intensity germicidal ultraviolet light (UV-C) to destroy more than 99% of airborne bacteria and viruses, including the flu, SARS, H1N1, pneumonia, MRSA, strep, TB, measles and the common cold. 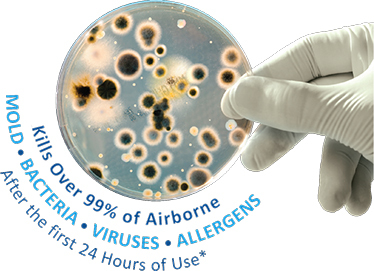 The RXAir's efficient destruction of pathogens, low maintenance operation and small footprint make it the ideal solution to prevent the spread of airborne viruses and bacteria while reducing the concentrations of volatile organic compounds (VOC's) and odors in homes, offices, schools, etc. How does the RxAir-400 work? The RXair-400 draws air in through a killing chamber cartridge where baffles provide the turbulence necessary to bring pathogens in close proximity to the special UV-C lamps. This allows the germicidal UV-C to kill any pathogens present. The catalytic technology also reduces odors from smoking, pets, mold and mildew, as well as harmful VOC's such as paint, varnish, formaldehyde, perfumes, nail polish remover and household cleaning products. Most contaminants are close to the floor, in the bottom 12" of the room - the unit draws the contaminated air into the bottom of the unit and expels the clean pure air from the top. Where do I place the RXair unit in a room? The unit should be placed in a location that pulls the contaminated air away from the living or sleeping space (as in a bedroom it should be placed in the corner of the bedroom furthest from the head of the sleeping individual, thus pulling untreated air away from that person. In salons or other commercial businesses, the unit should be placed in the furthest corner from the waiting area or application area. The unit should be placed at least 8 inches away from walls and heat sources such as radiators, stoves, or heaters. Does the RxAir produce harmful Ozone? Does the RxAir remove particulates from the air? There is a particulate screen which will remove pet dander, dust, etc. Each unit comes with 4 particulate screens and are easy to remove. To clean use a mild detergent followed by a thorough rinse with hot water, dry and replace. Is there any maintenance of the machine? No, other than cleaning the particulate screen on a monthly basis. How much square footage does the RXair cover? How long will the killing chamber last and is it easy to replace? Is this unit a HEPA filter? NO. HEPA stands for High Efficiency Particulate Air. A HEPA filter is a type of mechanical air filter. It works by forcing air through a fine mesh that traps harmful particles such as pollen, pet dander, and dust mites. As soon as a HEPA filter starts running the effectiveness diminishes as the filter gets clogged and contaminated and it requires regular replacement and maintenance. Neglecting filter maintenance can result in higher energy costs and diminished airflow. The RXair's effectiveness remains constant and is relatively maintenance free. Has this unit been cleared by the FDA as a medical device? Yes, and review the RXair white paper (click here). We have the highest single pass removal rate for viruses and bacteria as compared to our competitors. What is the size of the RXair-400 and what is the cost to run it? The unit is 32"H x 12.5"W x 9.5"D, weighs 18 lbs, and uses 93 Watts (like a 100 watt bulb), which makes it very efficient and cost effective to run. What is the warranty and how do I register my product? URcleanAir warrants this product to be free from defects in workmanship or materials for a period of one year. The killing chamber cartridge is a replaceable item warranted against manufacturer defects, but must be replaced after 8,800 hours (approximately 1 year of continuous use). You must register your RxAir-400 air purifier by mailing in the warranty card supplied with the unit to URcleanAir c/o URparamount within 30 days of receipt. We will repair or replace the defective part or unit (at our option). The warranty does not apply to damage resulting from abuse, damage or unreasonable use. Defects that are a result of normal wear and tear will not be considered manufacturing defects. This warranty does not cover damage from resulting from unauthorized attempts to repair or from any use not in accordance with the owner's manual. How does the Whole Home Duct Air Purifier work and what does it kill? As air passes the UV light inside your duct, exposure to the light penetrates the membranes of viruses, germs, bacteria, mold, dust mites and VOC's (Volatile Organic Compounds) and terminates them along with their ability to spread and grow again (99.9% kill rate). Where does the Duct Unit get installed? The Duct unit is easily installed in the ductwork near your system's air filter on either the supply or return side of the air handler. A template is supplied and all that is needed are tin snips or a utility knife to make two 1.5" square holes for installation and then it is plugged into any 110v outlet. Why might I want the WAND unit? Installation of a germicidal UV light inside the air handler inhibits the growth of mold which saves energy by allowing the system to operate more efficienty, therefore more economically as well. The unit uses approximately 18 Watts of electricity at a cost of under $1 per month. What is the life of the bulbs? 13,000 hours or approximately 1.5 years. We recommend changing the bulbs every year. How do I know when it is time to change the bulbs? A blue light will be on in the front of the unit that is easily visible when the unit is working. If the bulbs have reached the end of their life, the blue light will be out. The product is assembled in the US with some Asian parts. How large of a home will a unit cover? 2,000 square feet, but it's best to install one in each zone. Does the unit emit ozone? URcleanAir warrants this product to be free from defects in workmanship or materials for a period of one year. The bulbs must be replaced annually and are not covered by the warranty. You must register your air purifier by mailing in the warranty card supplied with the unit to URcleanAir c/o URparamount within 30 days of receipt. We will repair or replace the defective part or unit (at our option). The warranty does not apply to damage resulting from abuse, damage or unreasonable use. Defects that are a result of normal wear and tear or faulty installation will not be considered manufacturing defects. This warranty does not cover damage from resulting from unauthorized attempts to repair or from any use not in accordance with the owner's manual.